Saint Bavo Cathedral in Ghent, Belgium is over 1,000 years old. The Gothic cathedral is admired by guests for its nearly 300 foot tall tower, its four organs, and a remarkable collection of religious artwork. Catholic church services are held daily. The cathedral is home to many important works of Renaissance art. Flemish artist Peter Paul Rubens’ “Saint Bavo Enters the Convent at Ghent” hangs in the church, as well as several panels by Frans Pourbus the Elder and works by Lucas de Heere, a Ghent-born Flemish artist. The 15th century painting, the “Adoration of the Mystic Lamb” by brothers Hubrecht and Jan van Eyck is the most famous of the cathedral’s works of art. The painting is considered the principal work of the Flemish School, among the most important works of the Northern Renaissance and the most important artwork in Belgium today. The painting is housed in the Joost Vijd chapel, with access by paid visit only. Audio tours of the painting are available in several languages, as tour guides and others are not allowed to talk inside this chapel. Each day, the painting, which is a Triptych, is closed for one hour between noon and 1pm so visitors may admire the exterior of the painting’s panels. Four organs at the church are used for services, events and celebrations. The most conspicuous is the 1653 organ commissioned by Bishop Antonius Triest, and manufactured by France’s Bis and Destré. The organ is installed in a masterpiece casing designed by Boudewijn Van Dickele. The most famous of the organs was donated to the church in 1935. The18th century organ by Germany’s Klais was originally installed at the 1935 World’s Fair. With 6,000 pipes and five keyboards, the organ is the largest of the Benelux; Belgium, the Netherlands and Luxembourg. Two smaller, modern organs, from 1965 and 1974 are housed in the cathedral’s crypt. Among the impressive architectural elements of the church are the elaborate marble and stone naves in the upper church, the cathedral’s high choir with an 18th century Baroque high alter in red, black and white marble, and the 18th century Rococo pulpit of the nave. The pulpit, in gilded wood and oak and black and white marble, is surrounded by a detailed wrought-iron railing. Two chandeliers from the 16th century and Jan-Baptiste de Bethune’s 19th century stained glass windows are also widely admired. The cathedral’s crypt and treasury are home to Belgium’s most important collection of brocaded and embroidered liturgical ornaments, as well as a valuable collection of liturgical vessels, reliquaries, gold and sliver altarpieces dating back to the 15th century, and other religious artifacts. Frescos in the crypt date back to the 8th century, as well as some of the cathedral’s artifacts, including the 8th century Gospel of Saint Livinus. History: During the Middle Ages, Ghent was among the richest cities in Western Europe, and was therefore continually rebuilding and expanding the town’s cathedral, the origins of which can be traced back to a wood frame structure in the year 942 that served as the Chapel of St. John the Baptist. Some traces of the original wooden structure can be found today in the Gothic cathedral’s crypt. The church as it’s seen today is the culmination of continuous building from the 1300’s through the 1500’s. 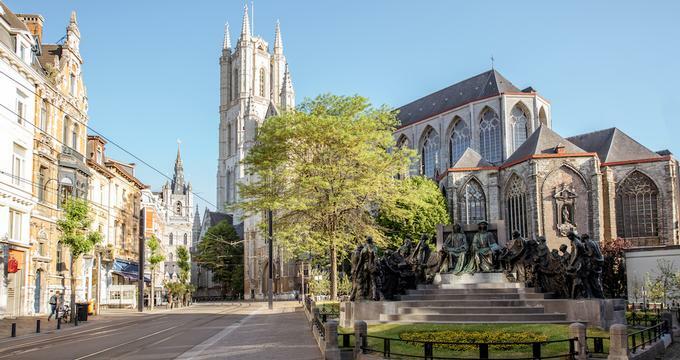 In 1559, with the founding of the diocese of Ghent, the church became a cathedral. It’s decadent baroque interior was heavily influenced by Antonius Triest, one of Ghent’s longest ruling Bishops. A major restoration of the cathedral’s main tower began in 2013, and is expected to last 5 years and cost close to 8 million dollars. A 5-year restoration project of the Van Eyck “Adoration of the Mystic Lamb” began in 2012. Visitors to the museum were able to follow the work in progress with live viewing set up in a safe space at the Ghent Museum of Fine Arts. Ongoing Programs and Education: Organ recitals, concerts and exhibitions take place regularly at the cathedral in addition to daily Catholic services. Past organ recitals have invited Ireland’s Raymond O’Donnel, Margreeth Christina de Jong of the Netherlands and Norway’s Erling With Aasgaard. Choirs from all over the world come to perform at the cathedral, including Japan’s Bach Collegium and the Orchestra of the Age of Enlightenment from London. School visits have included London’s award winning Terra Nova Chamber Choir, and Gloucestershire’s Wystone School Chamber Choir.